We are passionate about gaming desktops and no matter whether you need your fix of the latest big release or to immerse yourself in a virtual reality world, we can help. Using our advanced configurator, we can ensure that your new desktop will deliver perfect performance every time you play. If you are unsure, our expert in-house call centre will guide you through the selection process and place a custom quote on your account. If you need your new rig fast, we have designed a range of desktops that are ready for next-day delivery. Order today and you’ll be gaming tomorrow! Here at PCSpecialist, we can build your individuality into our gaming desktops. Our fully customisable options include your choice of; Case, LED Lighting, Custom Power Cabling and Liquid Colour* to match your perfect design. Never settle for anything but your ultimate gaming desktop and, with PCSpecialist, we can make it happen! The processor (CPU) is a one of the most important components within your Gaming PC. 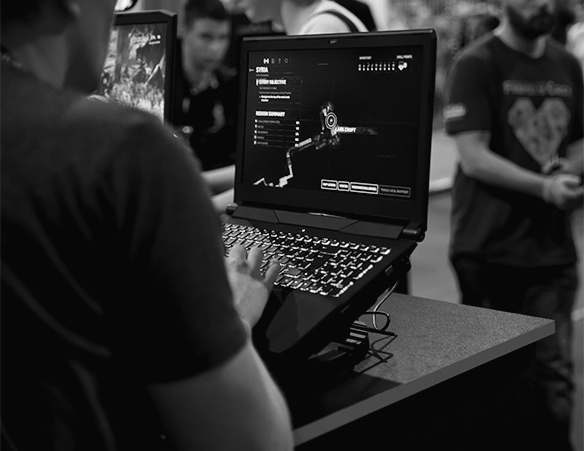 Select from Intel & AMD's latest CPUs to increase your competitive edge versus your in-game rivals. PCSpecialist use the most powerful Graphics Cards from both NVIDIA & AMD in our Gaming PCs, so you can enjoy stunning visuals and high frame rates in your favourite games. High quality memory results in smoother gameplay. At PCSpecialist, you can choose from Corsair or HyperX Memory (RAM) to power your next custom-built Gaming PC. Customise your desktop to your precise specification with our simple configurator. Using the latest and greatest components, you can choose from our vast range and build your perfect gaming desktop at a great price. We create each of our gaming desktops by hand and ensure that you receive the perfect product through our rigorous testing procedure. Our experts have years of experience in building all manner of systems. We have fine-tuned our production process over the last 14 years, always utilising the latest industry developments to improve our methods. Once your new purchase is in your hands, the longevity of your PC is guaranteed and you can get the best out of your new gaming desktop. Our staff are passionate about gaming and our production facility is always awash with excited chats about the latest releases and greatest retro games. Our enthusiasm means that we treat each PC as if it was our own, putting all of our care and attention into creating your perfect gaming desktop rig. 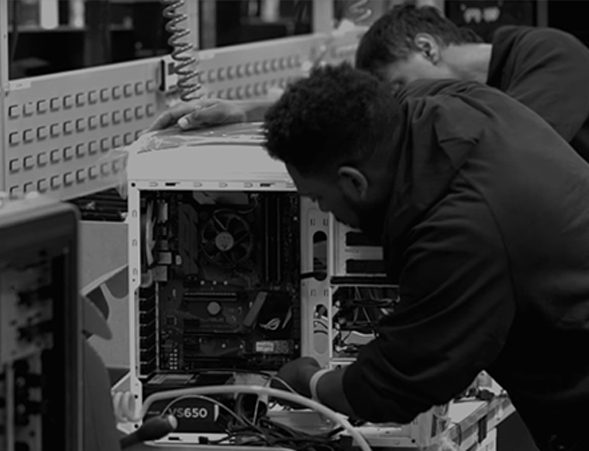 Gaming is many of our staff members’ passion, so when we are building a PC, we are always really intrigued with new rigs, and we put in the care to each build as if it was our own. We LOVE gaming! At PCSpecialist we build with passion—so rest assured you will be in good hands. Time For Your New Gaming Desktop? Have you been putting off your upgrade? Don’t want to spend hours checking component compatibility? PCSpecialist makes building your new gaming desktop hassle free. Our configurator has been designed to verify the compatibility of your selected parts and if you’re unsure of what to buy, just give our friendly call centre staff a ring. Click the link below and get building! In minutes, you’ll have your configuration selected and you can rest easy, knowing that we’ll do the hard work. You’ll be gaming before you know it! Gaming Desktops from PCSpecialist. Find your dream Gaming Desktops right here. Custom designed Gaming Desktops; built by gamers, for gamers! Get your perfect Gaming Desktop today!